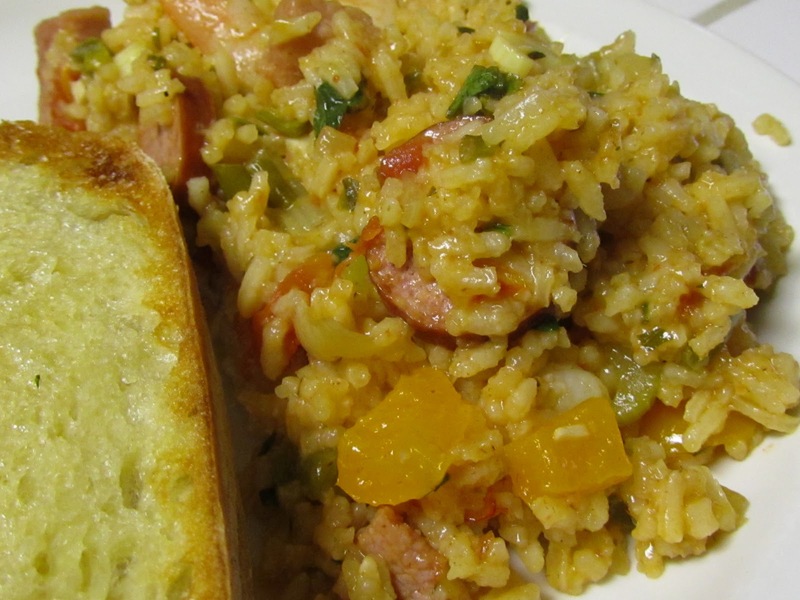 I had only tried jambalaya once before making this, and it was at a restaurant trying a friend's dish. It was flavorful and tasty, and I set my mind to be adventurous and make it sometime. That time finally came and went, and what I concocted was so flavorful and tasty, that I highly recommend this recipe. 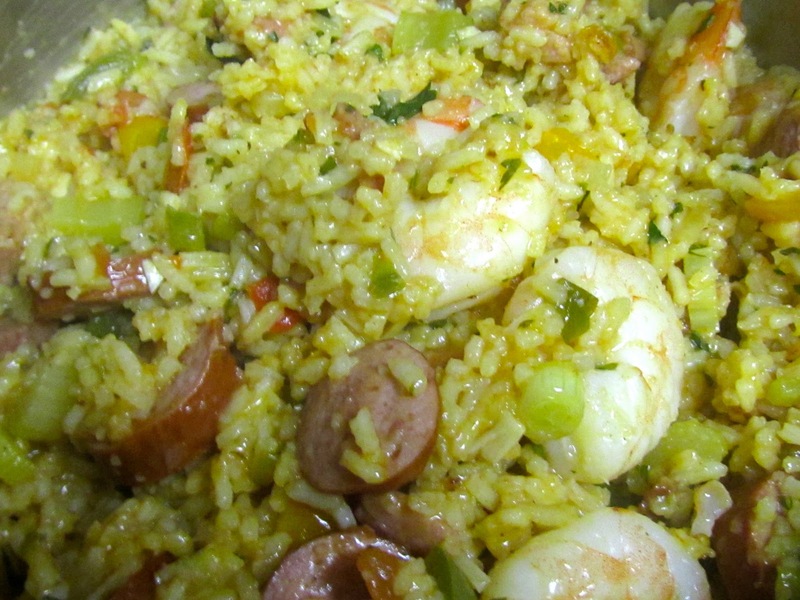 I elected to use a more traditional recipe with sausage and shrimp. Now let me say, I am not a big fan of shrimp. Every time I eat shrimp somewhere it's overcooked, and rubbery. I was enlightened at a college alumni event as to how shrimp should taste, and it was an amazing experience. I vowed to cook my shrimp properly, and it worked out beautifully. This recipe does make a lot, so if you are only feeding a few people, cut in in half. We made a whole batch and we couldn't quite finish the leftovers before they got tossed. 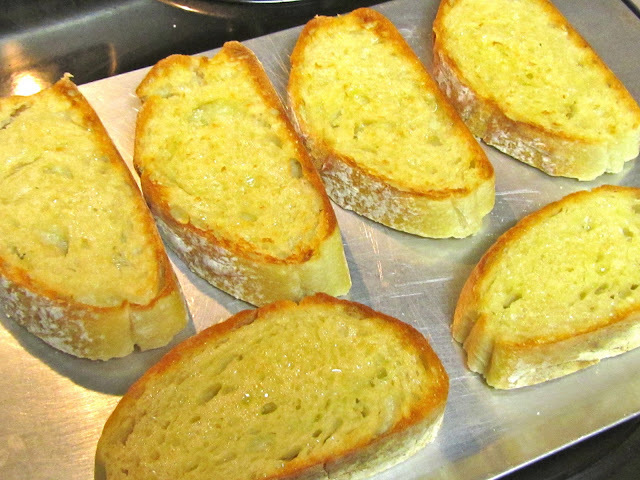 I served it with some butter-toasted bread and it was absolutely perfect. Tip: this recipe is much easier and quicker in the end, if you dice everything up first, measure everything out, put all the ingredients that are going in at the same time, in a bowl for easy transfer. It's your mise en place, everything in it's place. You can see that's what I did in some of the pictures. Check out those dicing skills! It was so colorful in the pot! On the plate, ready to eat! 1. Heat the oil in a large Dutch oven or black iron pot over medium heat, add the kielbasa and saute for 8 to 10 minutes, until browned. Remove the kielbasa to a bowl, and set aside. 2. Add the ham to the same pot and cook 8 to 10 minutes, until lightly browned. Remove to the bowl with the kielbasa, and set aside. 3. 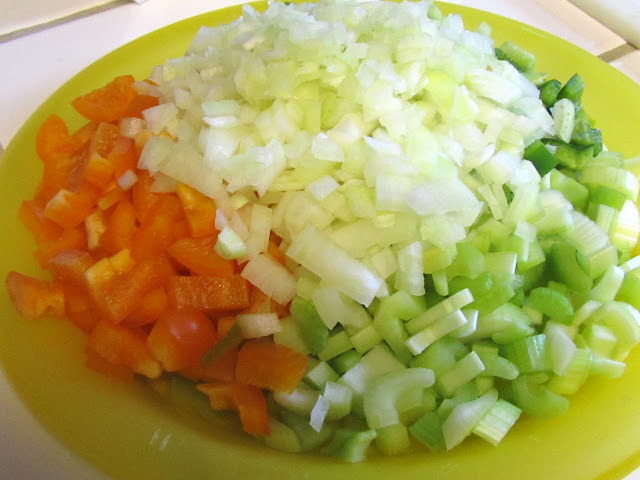 Add the butter, onion, celery and peppers to the same pot and saute for 8 to 10 minutes, until the onion is translucent. 4. Add the tomato, garlic, jalapeno or cayenne, oregano, thyme, and tomato paste and cook until all the vegetables and herbs are blended well. 5. Add the stock and bring to a rolling boil. Stir in the rice, and add the sausage, ham, bay leaves, salt, pepper and hot sauce. Return to a boil, reduce the heat to low and simmer, covered, for 20 minutes. 6. 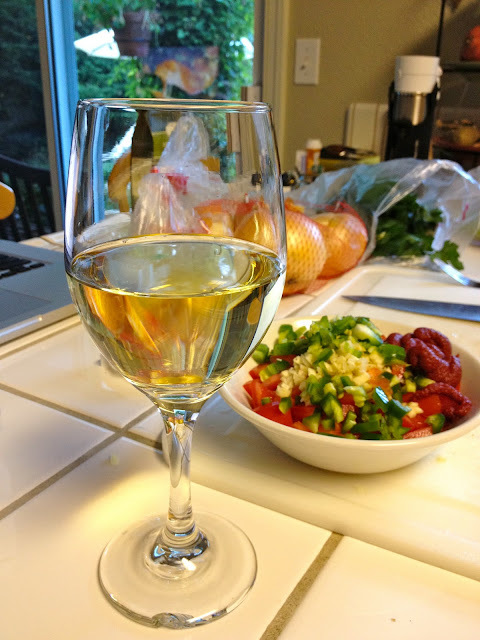 Add ¼ cup of the scallions, ¼ cup of the parsley, the lemon juice and the shrimp, and stir well. 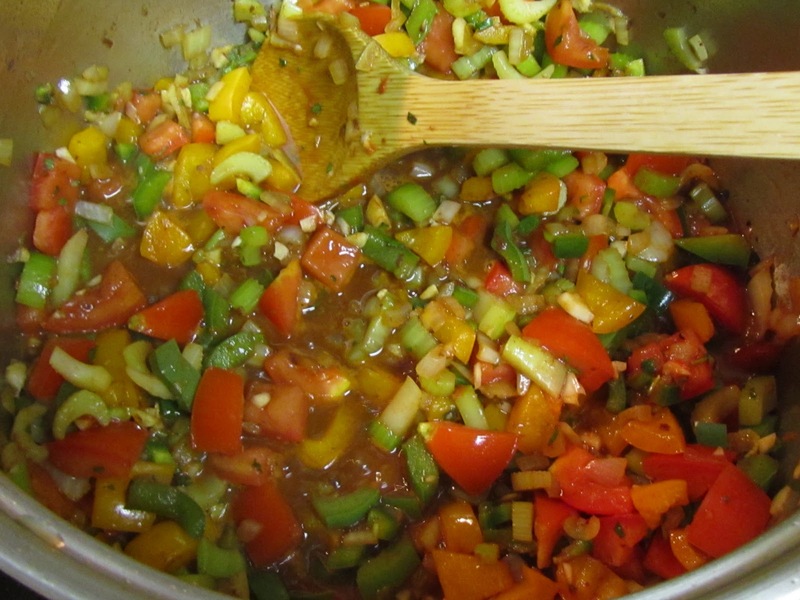 Cover the pot, remove it from the heat and allow the jambalaya steam, for 15 minutes, before serving. 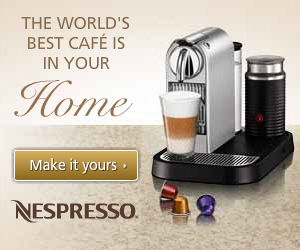 Remove the bay leaves. 7. Garnish with the remaining ¼ cup scallions and ½ cup parsley, and a dash of hot sauce, if desired.